I supported the WITCH: Fated Souls Kickstarter back when it was coming out and have been meaning to do a review for ages. Given that Halloween is nigh and the PDF is on sale at DriveThruRPG this might be a great time. +Elizabeth Chaipraditkul is a new name to the RPG biz, but one that is getting out there. In addition to being the lead hamster at +Angry Hamster Publishing she is also working with +Stacy Dellorfano on a new adventure for the upcoming Swords & Wizardry Complete 3rd Printing Kickstarter. 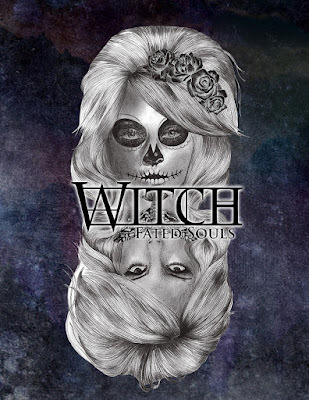 WITCH: Fated Souls though is her masterwork. WFS is a modern supernatural game. It has elements of horror and universe destroying, or defining, magics. Now lets be 100% fair here. We all have several of these sorts of games. I have more than I can count right now and I have written or worked on a few myself. So any game in this field has some really steep competition. For myself I am likely to compare this game to CJ Carrella's WitchCraft and to Mage: the Ascension. I am also likely to compare this to Ron Edwards' Sorcerer. Liz has an impressive RPG Playing career and you can see influences of D&D, Vampire, and Mage in her game. So WFS can be judged as a setting and for her game mechanics. As mentioned WFS is a Modern Supernatural game with elements of horror. Not, "you fail a SAN check" sort of horror but more along the lines of "what are you willing to do, willing to give up, for power". The characters of WFS are witches, also known as the Fated. These characters have sold their soul to a "demon" for power. In some cases, this is a fire and brimstone devil or it's a nebulous concept, the Horned Beast, the Reynard, or it is something they don't even understand themselves. For my review I am looking over my hardcover book and PDF from my Kickstarter package. This included a GM screen and a deck of "Devil Deck Cards". I also got a lot of images, character sheet package PDF and some desktop wallpapers. The book is 208 pages, standard format with full-color covers and interiors, though the color palette is predominantly blacks, blues, and violets. 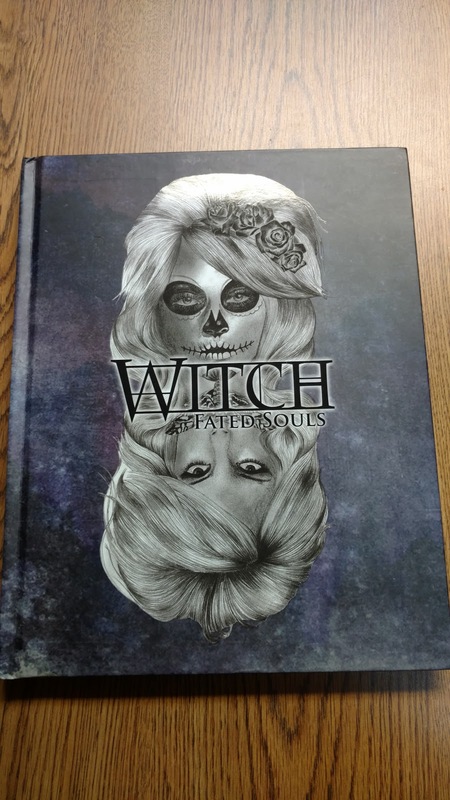 WITCH is divided up into nine chapters and an introduction. Here we get some setting fiction and the typical "what are RPGs" section. There is also a Chapter overview here. 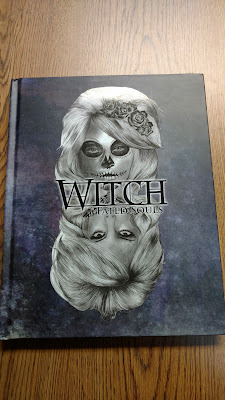 http://www.angryhamsterpublishing.com/witch/. Also detailed here are the types of demons associated with each Fate. When creating a character the player needs to think about who this character is and what they are going to be doing in this world. So there are prompts like "Before my Fating..." and "I was Fated because..." and "My relationship with my demon is..." Here, and throughout the book there are examples and story elements to help guide you. There is also a step by step instruction guide. Character creation, mechanically speaking, is a case of point-buy. If you have played WoD, GURPS, Unisystem or other games then this will feel familiar. Like WoD and WitchCraft we also get a couple pages, with character art, dedicated to each Fate. The art in this game is really great. This deals with the stats of your character; attributes (nearly fixed qualities like Charisma, Dexterity, and Intelligence), skills (who good are you at driving, etiquette, social empathy), pursuits (things you own or are), and talents (akin to magical skills or qualities). This is set up similar to many games so navigating what this is and how to use it are not difficult. There is a LOT of room for customization so the number of potential characters is really great. So there is no reason for every Sósyé or Djinn to be the same as the others. Now this is a fun chapter. An overview of the game mechanics of magic is given including the important "botch" roll. Magic here has a bit of different feel than otehr games. The closest for me is WitchCraft, but with plenty of Mage added in. Magic spells are grouped by Fate. So the Djinn have different magic than the Hecks and so on. All the fated also have access to Rituals, these are "longer" spells that take time and sometimes multiple casters. Others are simple spells that are more rote. In a similar cancept we are also given potions. 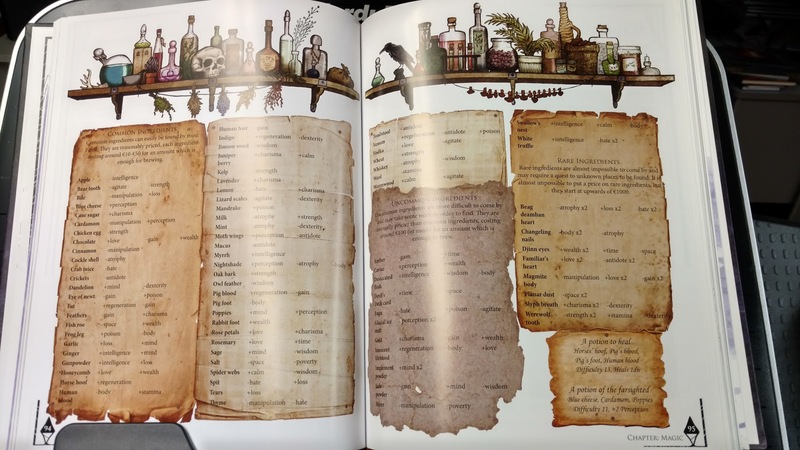 This is a true gem of these rules since it represents one of the best potion creation, use and mixing rules outside of the 1st Ed Dungeon Masters Guide. It also has some of the most attractive art too. The magic alteration section is great. This chapter is a treat since "higher level spells" are treated as something qualitatively different than the lower, more common magic. The only thing I can compare this to is as if there was a new D&D book that covered 10th level spells. This spells, known as Deireadh spells, can significanly alter the world and the character including, but not limited too, casting off their own demon. Even if I never get a chance to use this chapter in a WFS game, it has given me plenty of ideas. The mechanics of WFS is pretty simple. 2d10 add the necessary mods and roll higher than a 13 (or 11 in some cases). This makes many of the rule mechanics easy to abstract. Sure if you roll higher (with mods) than a 25 then you get an Outstanding Success and a natural 20 is still good. Botching is getting two "1"s. So again, the feel here is very much like WitchCraft. Picking up these rules are a simple matter. The rules have some special cases of course. Combat versus non-combat and using Talents. But nothing here will cause any experienced gamer any concerns. There are plenty of weapons here too. Don't go into this looking for differences between various types of guns, the rules are simplified to "light revolver" and "heavy revolver". But that is really all the game details you need. This chpater covers some specifics like wishes (we have Djinn afterall), Familiars, Artefacts, and using the Devil's Deck. The Devil's Deck was part of the Kickstarter and it looks fantastic. 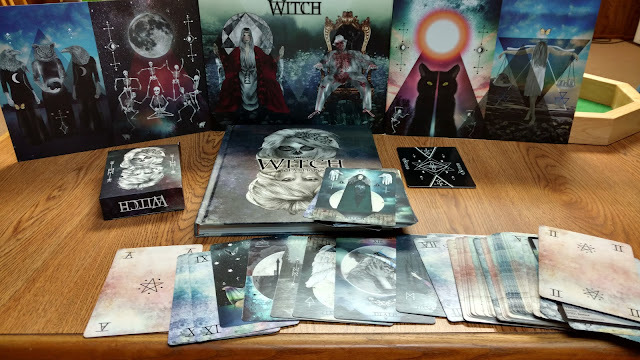 I think you can order one from AngryHamster, but a "Witches" Tarot deck would work out well too. This covers the setting and the history of the WFS world. This is what helps set this apart from other games of it's genre. I say "world" but I also mean areas and places from beyond this world. Pretty much what is says on the tin. Though there is a section up front on the various demons you can serve and what they are all about. A lot of creatures are present here (and many more an be added). There is also a good section of NPCs. Covers running the game and how to set the tone for this game. I have been picking at this book for months and maybe it because it is close to Halloween I now get what I want to do with it. This is a great game and with the right group, it will be a ton of fun. I'd love to try it at a con sometime, but this is a game of many sessions and developing plots and layers of story. This is a game of investment. I will be spending some more time with it. Will it replace WitchCraft in my life? No. But it will make a for a nice addition. I really, really like this game and want it do well. The potential here is great.